This version of spatial has been deprecated. For the current version of Spatial, please go to https://github.cmo/stanford-ppl/spatial. For a brief introduction to Spatial and its purpose, see this presentation. For a brief rundown of the language and its constructs, see these slides and the in-depth tutorials on this website. 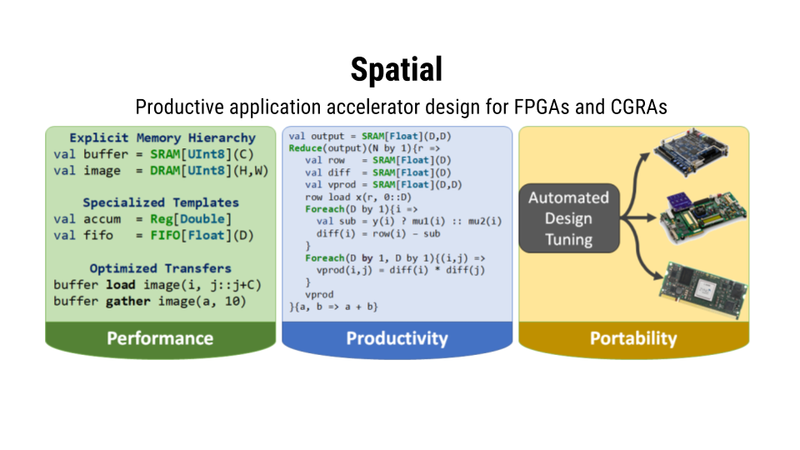 Spatial is a domain-specific language for describing hardware accelerators for use on FPGAs and other supported spatial architectures. The language is intended to be both higher level than hardware description languages (HDLs) like Verilog, VHDL, and Chisel, while also being easier to use than Altera’s OpenCL or high level synthesis (HLS) languages like Xilinx’s Vivado. To run Spatial on the new Amazon EC2 FPGA instances, see the AWS Tutorial. © Copyright 2017,Stanford PPL Revision 229b4dd2.